Good game graphics are not just about being pretty. Equally important is that they communicate well. The richer and more detailed a visual style becomes, the more difficult it is to communicate gameplay clearly. With the amount of detail and variation we wanted in Swords & Soldiers II it was a challenge to make the units, spells and other gameplay objects pop out against the colourful backgrounds. Today I would like to show the tricks our artists used to make this work. The reason this is important is that otherwise it would not be clear which objects are interactive and which are not. For example, is a tree a wall that I cannot pass through, or just a backdrop that has no effect on the gameplay? Ideally these kinds of things are immediately and intuitively clear to the player, without requiring any explanation. 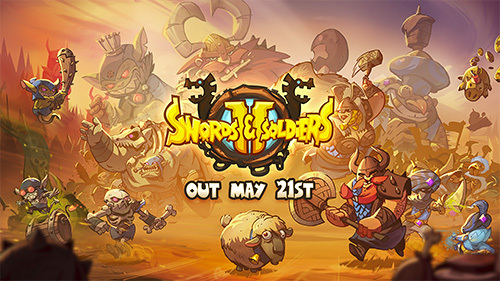 Our new game Swords & Soldiers II launches on Wii U on May 21st. The easiest way to achieve visual clarity is to not have any backgrounds or effects. Just a flat-coloured background with the gameplay objects. 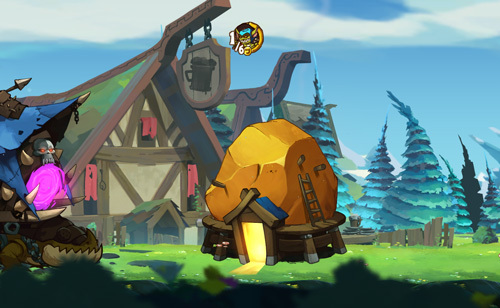 This looks horrible of course, so we want to add more art to the game. In general, the more you add to the world, the more difficult it becomes to distinguish gameplay objects from graphical fluff. In truly rich visual styles achieving clarity is a challenging balancing act. Objects should look like they belong in the world but at the same time pop out. The creators of a game can even choose to let go of visual clarity if they value visual beauty more. 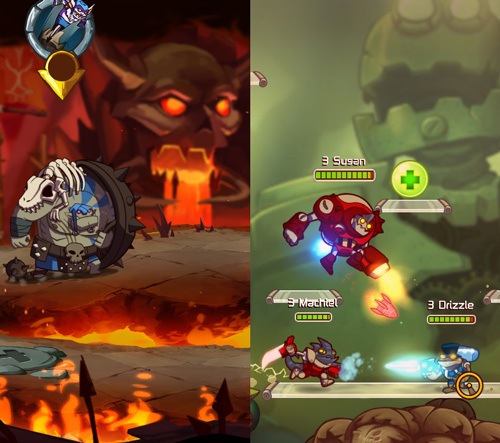 At Ronimo gameplay always come first, especially when creating highly tactical games like Swords & Soldiers II and Awesomenauts. 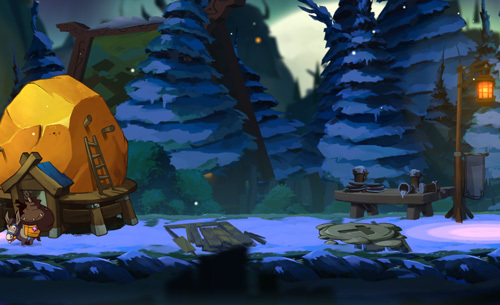 This means our artists had to employ a lot of clever tricks to combine the lush visual style with gameplay readability. Our art director Gijs Hermans is responsible for maintaining a consistent style throughout the game. For this blogpost I interviewed Gijs about the tricks used in Swords & Soldiers II. Our level artist Ralph Rademakers showed me some additional tricks. Below I will be showing the clever techniques they used to make the gameplay stand out. To make characters, spells and towers stand out against background objects they are drawn in a different style: with outlines and cell shading. The backgrounds are more painterly, lacking outlines and with more brushy and subtle lighting. In many Disney classics, like Jungle Book (top), animated objects are in a different style than non-animated objects. 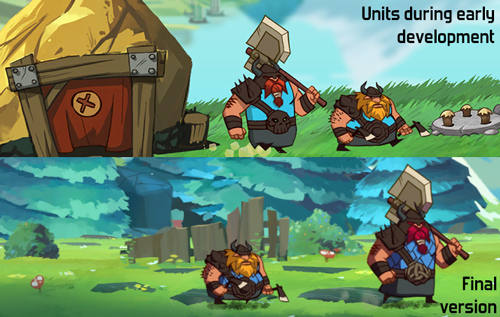 Our artists love this combination so they even combined the animated and non-animated styles within the Viking base for its different parts. Note the difference in outlines and shading between the animated caterpillar and the ship itself. 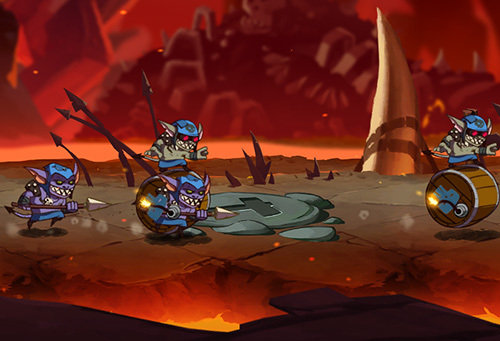 The first version of the Viking base was more in the style of the backgrounds. To make it stand out more the final design was pulled more towards the gameplay style. 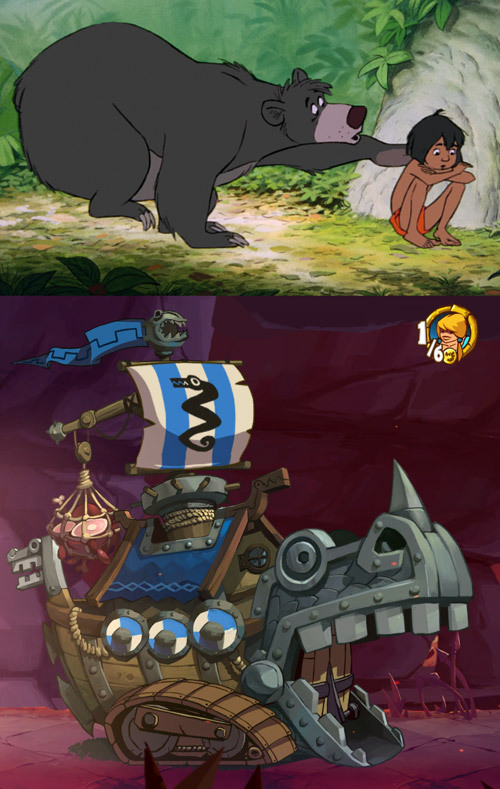 Early in development characters had hardly any shading (top), making their shapes less readable. Their final designs (bottom) have deeper shading and more saturated colours. Our artists tried a lot of different shading and outline styles for gameplay objects. This image shows a series of early experiments with the goldmine. All the way to the right is the final design. Be sure to click this image for full resolution, since this scale does not show the differences well. Background graphics are less saturated. Our level artist Ralph even used such atmospheric perspective on objects very close: the house here is directly behind the playground and thus too close for 'real' atmospheric perspective. Ralph desaturated it anyway to make gameplay stand out more. 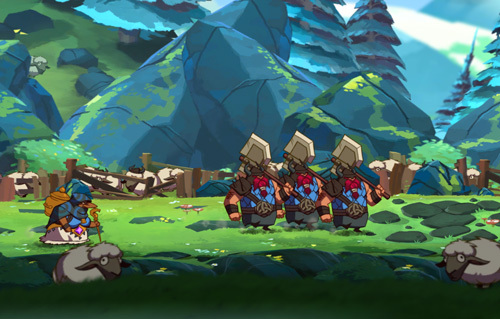 Sheep are sometimes gameplay objects and sometimes background objects. To make this clearer they are blended a bit towards a single colour when they are in the background or foreground. Background brightness is often changed to make gameplay stand out more. 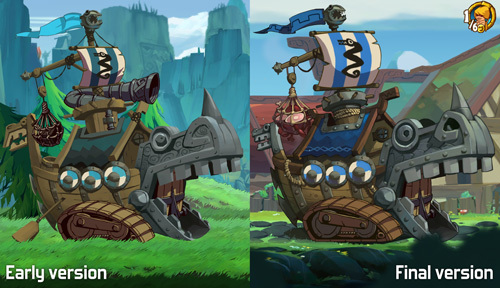 In both of these images the background is brighter near the gameplay layer, adding contrast. Higher up in the screen no gameplay happens, so there 'normal' colours are used in the background. Gradients are not the only way to make the playground stand out: here the bushes directly behind the playground don't have snow, turning them into a green border between the snowy playground and the snowy trees. It would be weird if only these objects lacked snow, so snow is also removed from other objects like the rooftop in the background on the left. Corpses have gameplay functionality but having lots of them really clutters the view. We therefore desaturate corpses to make soldiers walking in front of them stand out more. Depth of field blur on the background not only adds depth but also makes the foreground pop. 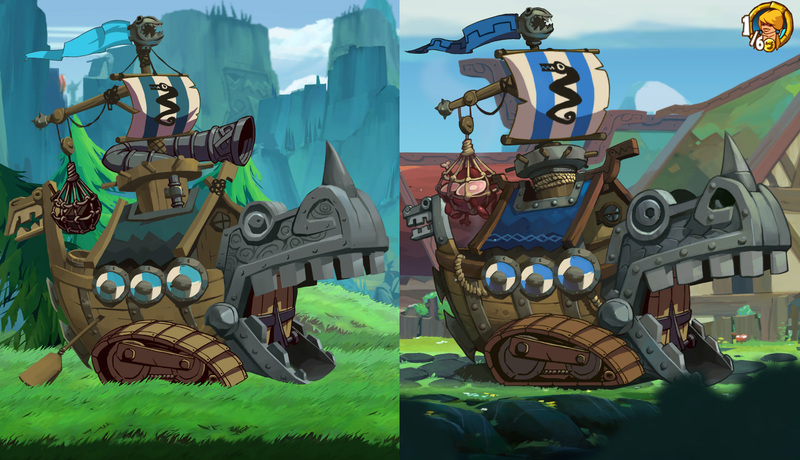 We use this trick in both Swords & Soldiers II and Awesomenauts to make gameplay more readable.